The Tipo G is by far the most productive pull through type plate processing system currently on the market which achieves an increase in productivity of up to 40% than other pull through systems. 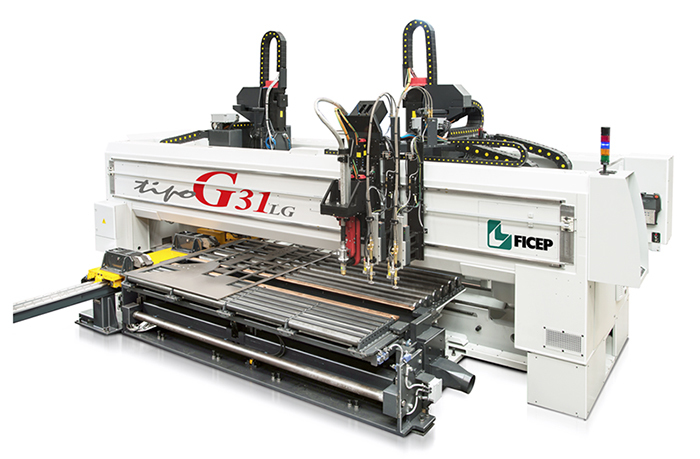 The Tipo G features a dual bridge type structure that incorporates up to two high performance drill spindles. Each drill spindle has its own independent sub axis so regardless of the multiple spindles programmed task within the process zone they both are engaged simultaneously. For example both spindles could be drilling, milling or scribing simultaneously even if the programmed task for each spindle is different. It is like getting two plate processing systems in the same foot print. 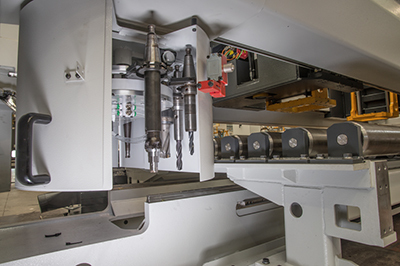 Each spindle is served by a 24 position automatic tool changer to address a requirement for a diverse number of processes within one fully nested plate. 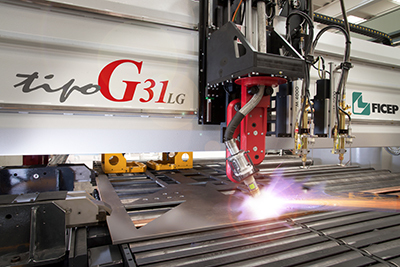 The Tipo G can be furnished with up to two independent plasma bevel heads for enhanced productivity. 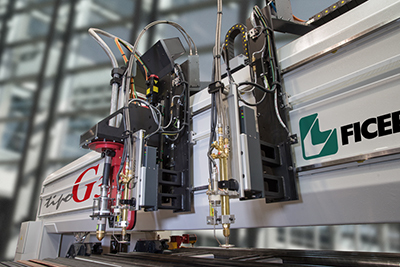 Multiple oxy and plasma bevel torches can be furnished in combination as part of the Tipo G to also increase the productivity of the cutting operation. The Tipo G is available to accommodate both 8’ and 10 wide plates in lengths up to 40’.